I know most of you here love fruit custard. But, today's recipe is not about the usual fruit custard that we make from store bought custard powder. I prepared this using the leftover Mango Milkshake. Orange, apple, pineapple and nuts in the milkshake tasted very new and had very nice flavour. 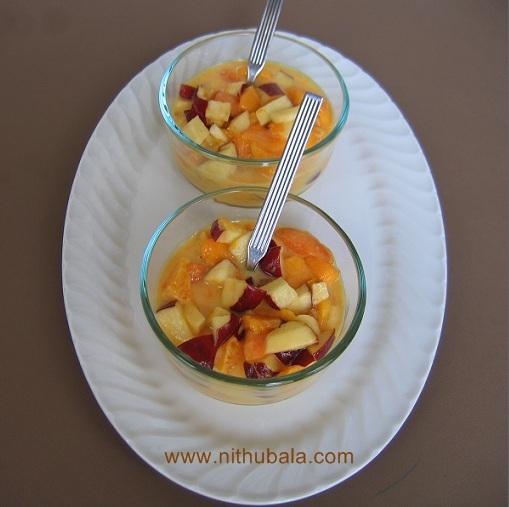 this looks yum nithu..im sure mango flavour wud be quite delish ! This is soo delicoious !! oohh i want some! i already liked the mango shake you had in your previous post, now with fruits??? double yum! Custurd with a twist, sounds you!! Cool idea,sounds great nithu,loved it! that looks delicious and innovative dear!! I love mango in custard.Must be great taste. A lovely fruit Custard! Yumm! Sounds great and looks so yummy!!! Delicious custard !!! Love the idea of using mango milkshake..Colorful treat !! Feel good custard n nice twist with the milkshake nithu. Delicious twist, would love to have some..
very easy yet delicious custard. love this idea of using mango milkshake.